We all hope and we all wish that someday we must win a lottery! Nothing like sudden unexpected wealth drops on our lap! Whether any one of us is a compulsory and obsessive gambler, and keep gambling all the time OR we are just ordinary people and we buy the Lotto ticket occasionally or visit the Casino for fun, or bet on horses and races. Even innocent gambling like predicting result for today’s cricket /football match. Whether we are heavy roller in casino or stock market, the common desire which motivates our action is the desire for unexpected Karmic gains in life. Karmic gains or Karmic rewards are the rewards for our Past Karmas either in this life or in previous lives which are likely to be manifested in this life only. This personalized report has been prepared with the help of "Vjyotish" and provide the astrologically favourable days during the chosen period when you have better chances to gain from speculative activities like buying lotteries and gambling. Based on a very complex analysis, it selects the most favourable days, the neutral days, as well as the least favorable days , during a given period of time, when you are free to pursue speculative activities within your limits, or if you must pursue, you must do so with great caution, or you should totally refrain yourself from any kind of speculative activities subject of course to the speculative index value computed from your natal chart. This report is based on your following birth details and the values are specific to you and are computed on the basis of the strength and resultant influence of transit of the planets and its effects on you during this period, based on your Natal Chart. Time zone: 8:00 hrs ahead of GMT Applicable Day Light Saving Time: 0.00 hr. Using Astrology can help you win money. Timing is everything. Really everything. The Vjyotish report is short, simple, and very powerful. It clearly indicates your luckiest days when odds will be in your favour, and the unluckiest days as well. Many winning dates are now fairly easy to see. Look for a day when there has been a buildup of good transit activity (indicated by highly positive Vjyotish index values). Most wins occur under favorable planetary configurations, when there are no adverse transits. This knowledge alone can save you a lot of money if you simply do not gamble during your unfavourable days. "Vjyotish" is a dynamic model for predictions, based on Vedic Astrology principles. 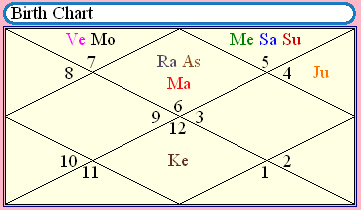 The innovative is the 'concept' and 'method' of drawing a net astrological conclusion in precise numerical terms, called as 'net astrological effect', by mathematically quantifying various key astrological parameters. The method is unique in that it quantifies the benefic and malefic influences of each planet in precise unambiguous figures. It is also unique in that it combines the effects of different planets and houses and can integrate the effects of various planets with respect to each other. The program integrates natal promises of various planets in a horoscope with their transit status in a very simple and elegant manner. The innovation is in the 'way', in which several established Vedic astrology principles are simultaneously integrated to gauge the exact benefic and malefic effects of each planet in natal horoscope as well as in their daily transit. The minimum and maximum theoretically possible astrological values for 'Luck-index for sudden fortunes & lotteries' are -655 and +655 respectively. From your natal chart, we have computed the chances or potential that you have for Karmic rewards in your life. This we define as the “Speculative Index” in your chart. The maximum index Value can be +655 and minimum value can be -655 in any chart. If the index value in your chart, for any given day, is greater than 50%, that is, the value is not negative and more than ZERO, your chart then has some potential or odds in your favour to gain from speculative activities whatever that speculative activity will be. The higher the index value , the better will be the odds in your favour on that day. If it is less than the average value, then it is unlikely that you will gain anything significant in any speculative activity on the day concerned. However, this Vjyotish index oscillated between -435 (Lowest value) and +435 (Highest value) only during the analyzed period. The program picks Highest or Lowest values, whichever is greater (leaving aside the +/- signs), and draws the Vjyotish index taking ZERO as median value. So, if there is a negative date with lowest value, then though, there may be no date with highest value, it will draw the index on a scale of lowest value (say -435) to highest value (say +435). The 'Excellent', 'Good' or 'Fair' index scores in this report always show possibility of positive, favourable and desirable results. The 'Inadequate', 'Poor' or 'Very poor' scores indicate negative, unfavourable and undesirable results. On and around dates, with negative scores, you need to be cautious, should not be unduly proactive and should observe extreme prudence and caution in your speculative activities. The 'Average' scores bring mixed results. We again remind you, that the above categorization is based on the comparison of a day's Vjyotish index value with the minimum and maximum theoretically possible astrological values (i.e. from -655 to +655) for this index. Now, we are giving you the 'Best' 10.00% and 'Worst' 10.00% of dates, in exact order of their Vjyotish index values, calculated during the analyzed period. Now, I am providing you a table here-in-below, which tells you that what "Primary Root Number" suits you best on a particular date. All analysis continues to be based on purely Vedic Jyotish methods. Do not confuse it with numerology or Western astrology. Each single core number, from 1 to 9, is represented by one of the planets. This report calculates the beneficence value of each planet for your chart - on daily basis. For larger numbers, reduce them by adding the digits together until the sum achieved is one of the core numbers. Merely add the components of the larger number together (repeatedly, if necessary) until a single digit results. Though, a number may be found most suitable in your natal chart generally, but it is not necessary that the number is also suitable on a particular date. Same way, a most unsuitable number may be found suitable on certain dates. The dates has been written in "dd/mm/yyyy" (date/month/year) format. That means, if written "09-10-2010", it means 9th October 2010. Thereafter, the nine columns show results for nine numbers, starting from number 1, then number 2, and so on. The last column shows result for number 9. The results have been categorized in seven categories, as "Excellent", "Good", "Fair", "Average", "Inadequate", "Poor" and "Very Poor". You should buy a lottery ticket with root number which has been indicated "Excellent", "Good" or "Fair" on concerned date. Please note that the above mentioned "Panch-pakshi" based report is a separate report and is not a part of the current report. I would appreciate updates from you about the actual results and feedback about the report's utility in your lotto gaming or other such activities. Please note, we do not advice reckless speculative activity for any person. The main purpose of this report is of course to advice you about the least unfavorable days, when you must refrain from any kind of speculative activities, so that your losses are minimized.